Make your house the talk of the neighborhood this Halloween by transforming your front porch into a haunted house. Halloween decorations are the perfect way to create a graveyard on your front lawn, spook the kids when they come for candy, or host a fantastic Halloween party. Just beware, you may not get as many trick or treaters! Start creating your haunted porch with the basics. Cob webs are essential and affordable. Use them to create a creepy backdrop or accent to your other decorations. Stretch them over your railings or border the door with them. You can even put them in your trees to maximize the eeriness. 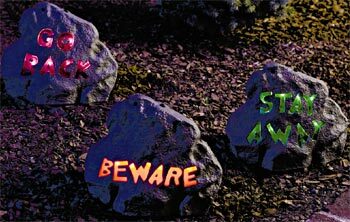 Place haunted yard signs or lighted rocks with warning messages to caution visitors and trick or treaters that they are in for a scare. Set the scene starting with your yard to thoroughly scare your neighborhood. Place a crime scene decoration in your driveway and create a cemetery in your yard using personalized tombstones. Add an extra scare with an animated grave, which will scare visitors as they arrive. Border the area with a cemetery fence or haunted house caution tape. For a complete spooky look, try the Haunted Cemetery Decorating Kit! Move on to the porch to continue the haunted fun. Place a coffin on your porch to extend the cemetery. Really make things spooky on your porch by adding a fog machine to envelop all your decorations in an eerie haze! Place a crypt keeper standee or a glow-in-the-dark skeleton in a dark corner to startle guests. Drape a rusted chain over your railings for a menacing effect. Add some special effects with lighted bones windchimes for a spooky glow or an animated Grim Reaper to frighten visitors and wish them “Happy Halloween.” An animated door curtain will add a spooky effect when you answer the door. The curtains part and the skulls at the top light up! Leave some candy out for the kids in a wandering eyes candy dish. When they reach for the candy, the eyes will move around to watch them. For a finishing touch try dressing up in a scary costume and sitting on your porch. As kids come up to trick or treat, sit perfectly still. Hold the bowl of candy in your lap and only move when the kids reach for the candy. You could also have a scary music CD playing or make spooky noises yourself. The possibilities for a haunted porch are endless. We’d love to hear about your Halloween decorating ideas! This entry was posted on June 18, 2007 at 10:16 AM	and is filed under Halloween Decorations, Trick-or-Treat. Tagged: Halloween Decorations, Halloween Party, Haunted House Decorations, Trick-or-Treat. You can follow any responses to this entry through the RSS 2.0 feed. You can leave a response, or trackback from your own site. Hey This Is Awesome Everybody did not want to come NEAR my house! I am throwing a halloween party and like the house/mansion/castle picture with all the tombstones around it on the halloweendecration wordpress site. What is it made of and what are the demonsions etc to make on for my my backyard? yellow “caution dont enter haunted house” tape.